Nicole Taylor ’17 and Christian Hood ’18 spent a week shadowing the chief operating officer of the San Francisco 49ers. 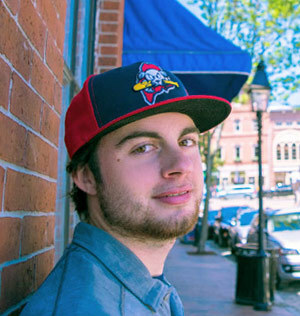 Will Hyland ’19 combines a love of sports with hometown pride during an internship with the Portland Sea Dogs. Prepare for a career as a sport management professional who thinks critically, leads effectively and makes ethical decisions. Guided by the standards of the Commission of Sport Management, Colby-Sawyer’s curriculum allows you to focus on one of four concentration areas: sport business, sport information and media, sport studies, or sport and recreation leadership. Small class sizes and multiple research and field experiences help you gain expertise in all facets of the sports industry, including media and communications, legal and financial services, sponsorships, sales and marketing, ticketing, event management, wholesale and retail sporting goods, coaching, nonprofits, community development, gaming, sport tourism, recreation and facility management. Build your resume with two required internship experiences and a Capstone research project, then graduate ready for a big win in this exciting field. Qualified Colby-Sawyer sport management graduates are automatically accepted into the University of New Haven graduate degree programs in sports management. First-come, first-awarded scholarships are available for this top-ranked graduate program in Hartford, Conn.